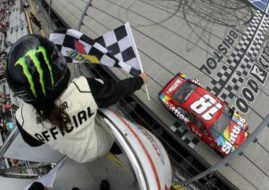 Kyle Busch scored his fifth win of the season and 48th NASCAR Cup Series in a career today at the Chicagoland Speedway. The driver of the #18 Joe Gibbs Racing Toyota Camry has won the Overton’s 400 after surviving a crazy last-lap clash with Kyle Larson in the #42 Chip Ganassi Racing Chevrolet Camaro. Busch became the second driver with five wins in 2018, next to Kevin Harvick who finished third today in the #4 Stewart-Haas Racing Ford Fusion. With this victory, Busch extended the lead in the Cup Series points after seventeen races. Martin Truex Jr. finished fourth in Chicago, ahead of Clint Bowyer. Erik Jones, Denny Hamlin, Joey Logano, Brad Keselowski and Alex Bowman completed the top 10.